Rome has a magnificent collection of epigraphy and lettering at the National Roman Museum at Diocletian's baths. What did the Romans ever do for us? 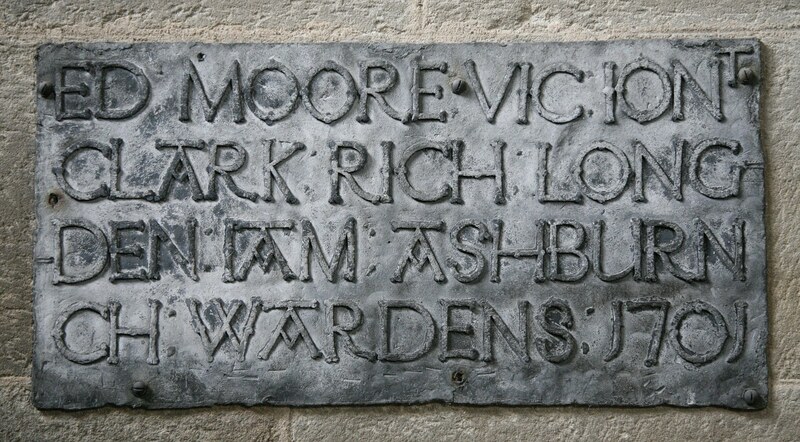 Well apart from giving us the makings of a network of highways, indoor heating and bathing, sewers and a wall to keep out the Scots, they gave us carved lettering. Our classic V cut letters are exactly like those cut by the Romans. 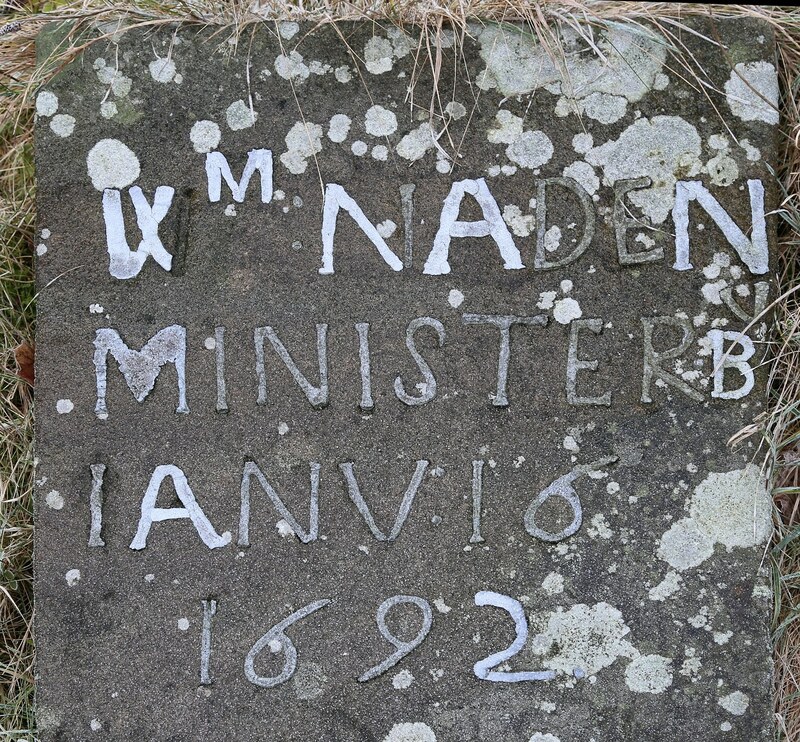 This post starts with a close look at some Roman letters and then other of kinds of lettering you might find in an English church or the graveyard outside. These islands didn't have a common system of writing before the Romans arrived, so actual styles of lettering were a sophistication lost on us. 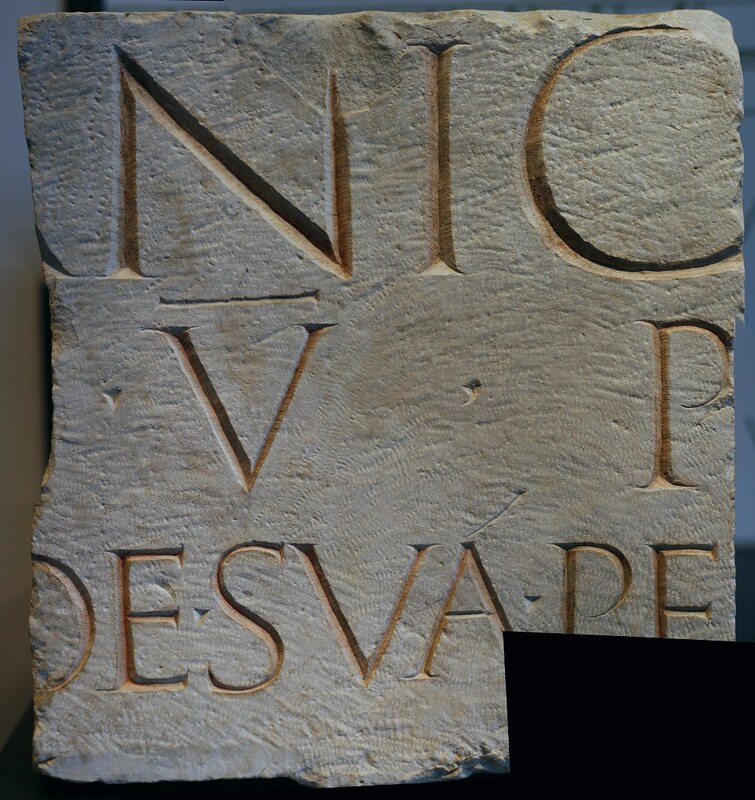 Roman lettering was already well developed by the time the Romans first came to Britain in 55 BCE, but what we now think of as the ideal Roman letters were carved in around 113 CE on Trajan's Column. I'm not going to rehash the tale of Trajan and his column here, people have already done that for us. 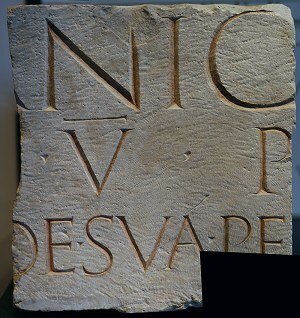 First, let's look at how Roman lettering was cut. 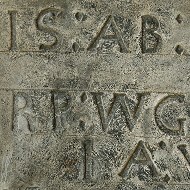 The Romans used chisels just like those we use to carve lettering today - except ours are tungsten tipped. 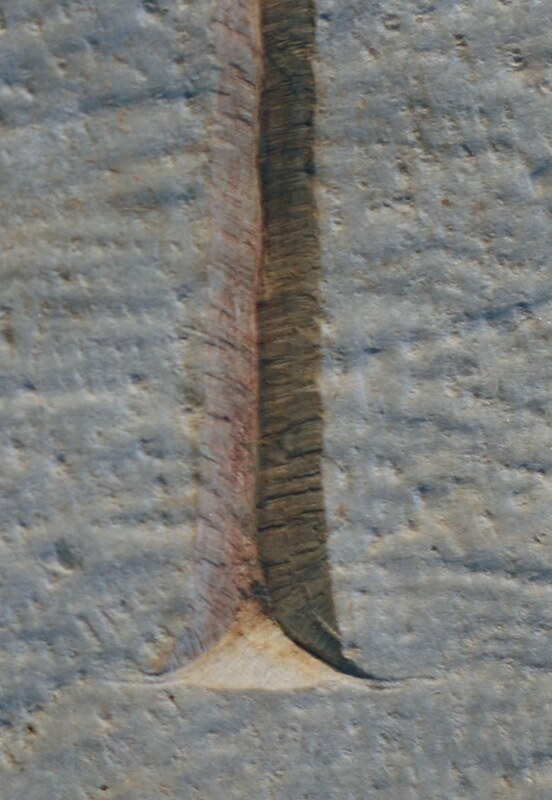 On this example you can see every cut, each made by a tap of the hammer. The largest of these letters are about a foot high, so the cuts are clearly visible. This piece was in an exhibition about Nero, housed at the Coliseum. Nero's rule predated Trajan's Column by 50 years. The stone was part of a (reworked) temple but the work was ultimately carried out for the emperor. 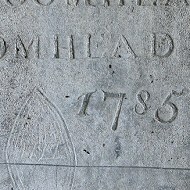 The chisel was narrower than one side of the broad strokes of the letters, so two passes were made to cover the width of the cut. 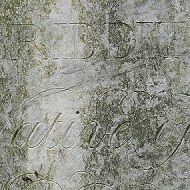 Inside the letters was painted red and the paint or ink can still be seen. Standing right in front of these letters at eye height was like looking over the shoulder of the letter carver. I could see how the letters were cut, I could see slight marks in the cuts where the tip of the chisel was nicked and I could have given him a hand because the material, the tools and the process were so familiar. Fast forward a thousand years or so to rural England. 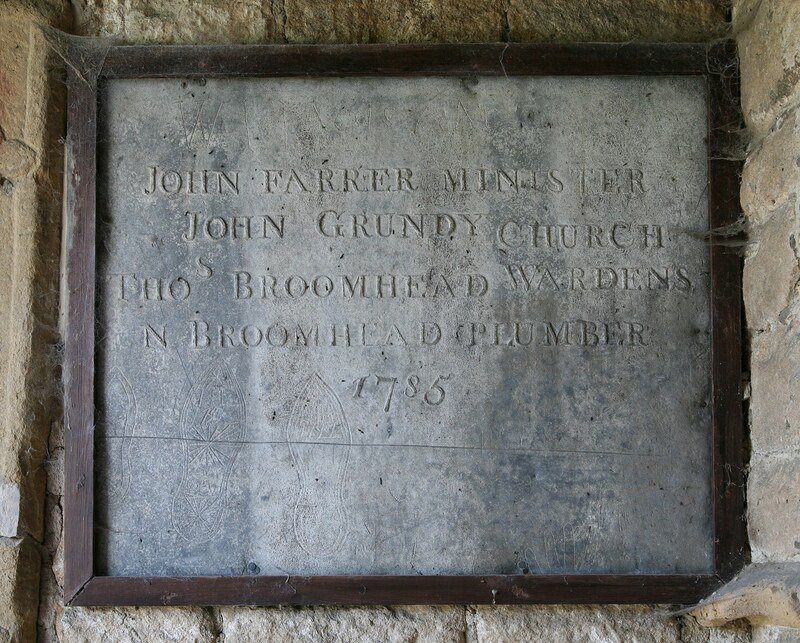 Clergy, the aristocracy, wealthy merchants or perhaps those with the right to appoint the clergy in a church, could have the honour of a memorial inside the church. 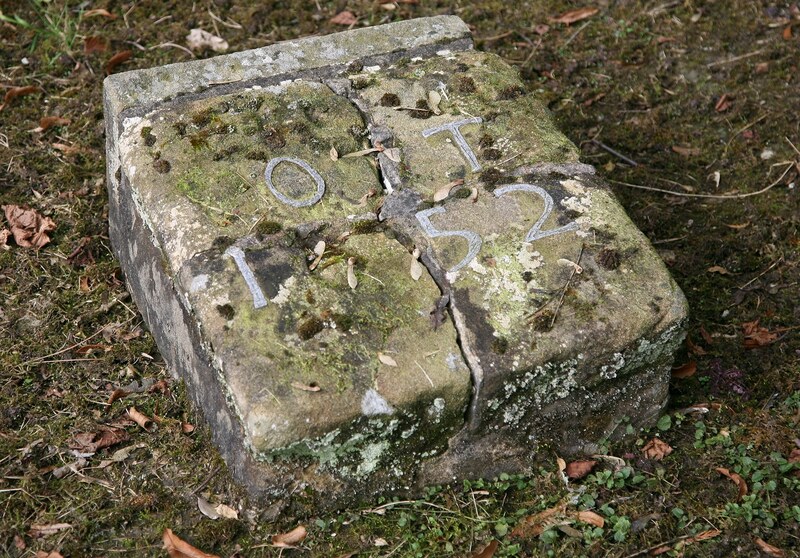 Early memorials might involve a whole or part effigy with little or no lettering (or the memorial may have been moved, damaged or altered in the intervening centuries). 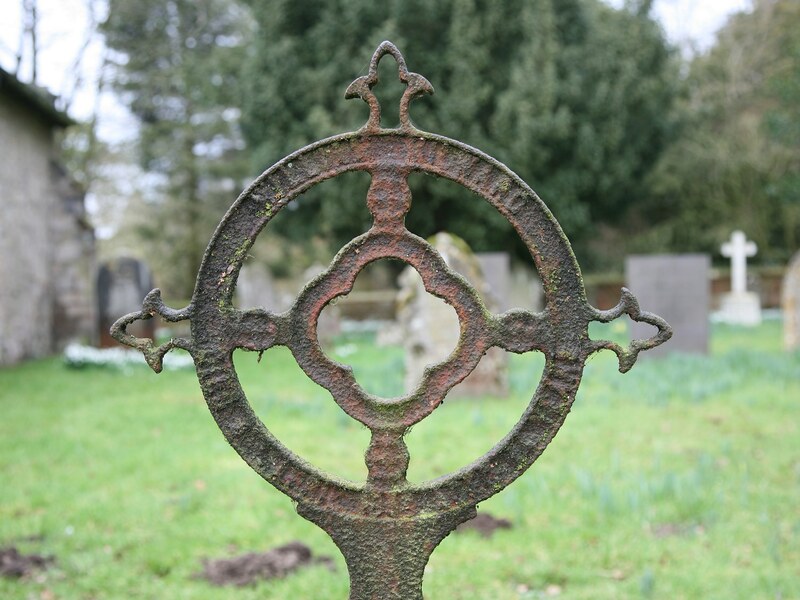 You could see a box tomb set with brass inlays showing idealised figures of the deceased and inscriptions on brass strips telling their name, dates and status. 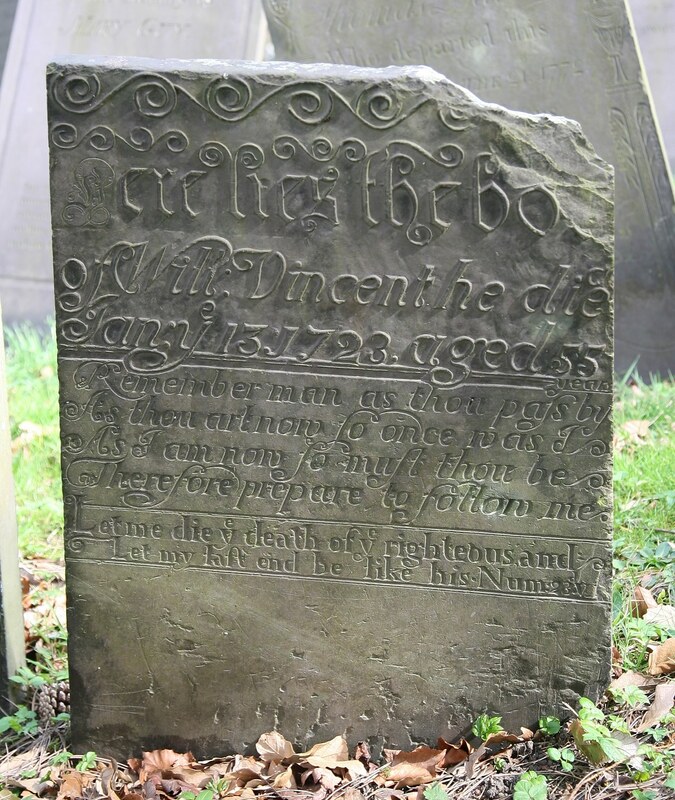 Slightly later memorials could be elaborate multi-storey affairs with figures of the deceased and their children and long inscriptions describing their lives. 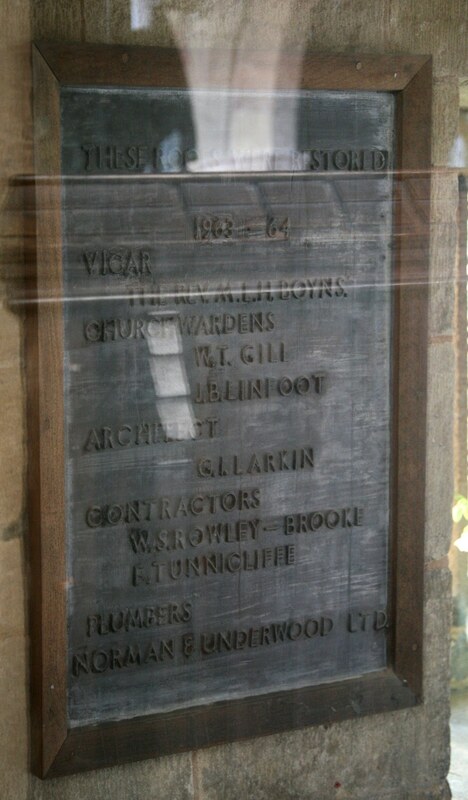 Memorials inside the church are protected from the weather so have often remained in very good condition. They also tend to be expensive statements of wealth, position and connections and would be made by the finest craftspeople available. 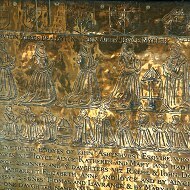 This memorial, to the Reverend Samuel Pole, his wife Mary and their six children, is in All Saints church, Mugginton, Derbyshire. 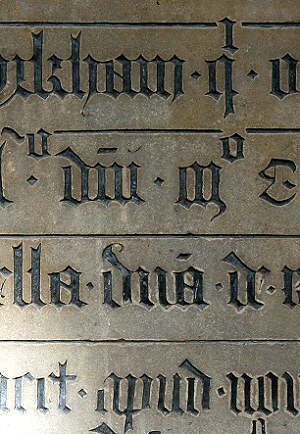 It shows that the letters have been V cut in the same way as the Roman letters earlier, but then filled with a black paste to provide good contrast. 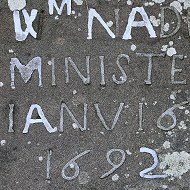 The marble is a little grubby now but when this was installed it would have been crisp and clear with very good contrast between the black letters and the near-white background. 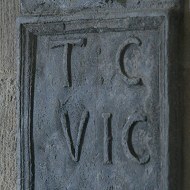 This example of previously filled letters is in the ruined Carmelite convent in Lisbon, Portugal. 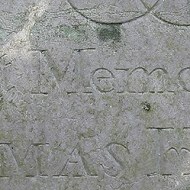 The memorial has been out in the open since the 1755 earthquake which destroyed much of the city so most of the filling is lost, but we can still see that a similar technique has been used - V cut letters filled with a dark paste or mortar. The insides of the letters are a little rough in places because that part would be covered by the filling. Only the outline of the letters needed to be made good. Sometimes instead of having a solid filling, the letters are cut and then painted. The chancel of St Mary the Virgin, Bottesford, Leicestershire is well stocked with grand memorials. 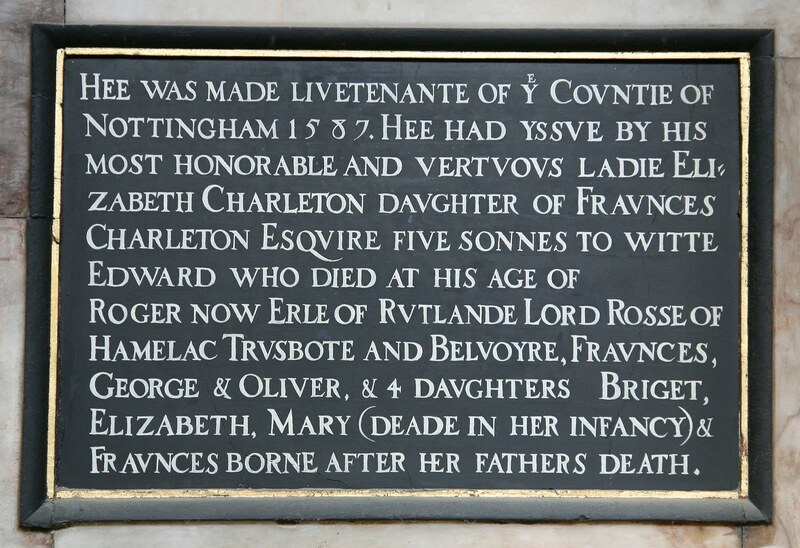 There you will find this early 14th century memorial to Lord Robert de Roos. 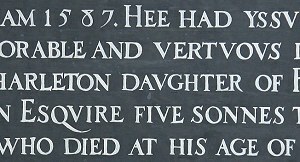 The style is 'black letter', based on the manuscript letters of the day, and the square cut letters have been painted black. I wonder if the capitals were once red like the 'rubric' letters in manuscript and early printed bibles. 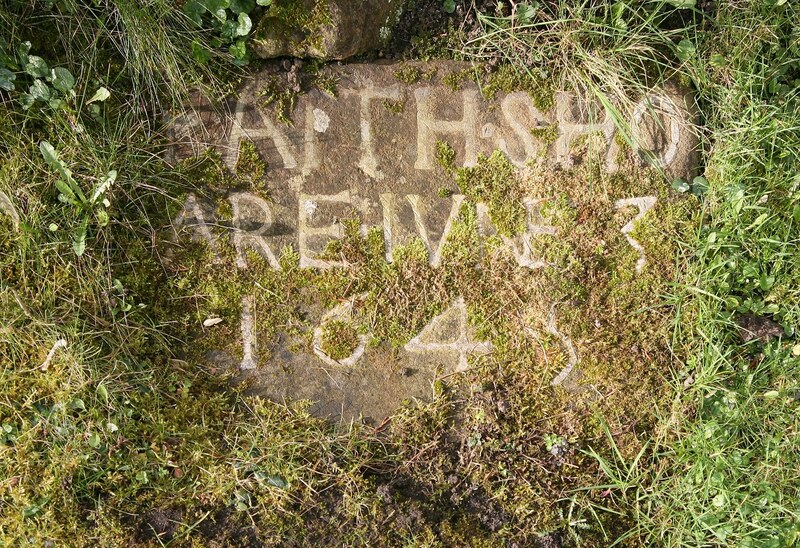 The paint has almost certainly been reapplied in the 700 years since the letters were cut. 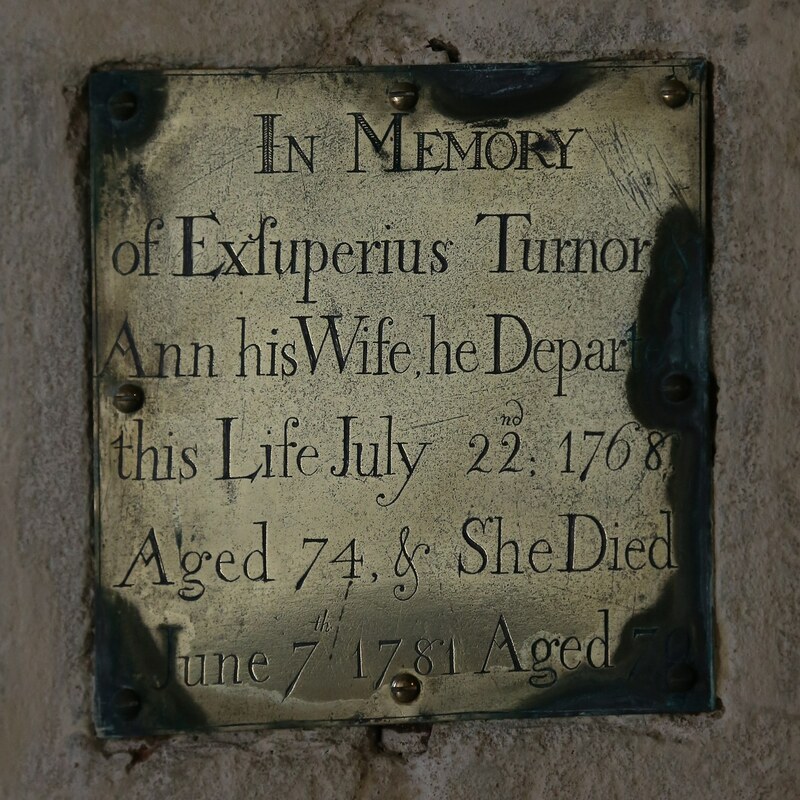 Elsewhere in the chancel at Bottesford is a memorial featuring this very freshly repainted text describing the life of the 'Lord John Erle of Rutlande'. The lettering style looks like that which would have been used in the 16th century, but the overpainting may have obscured fine details of the original work. 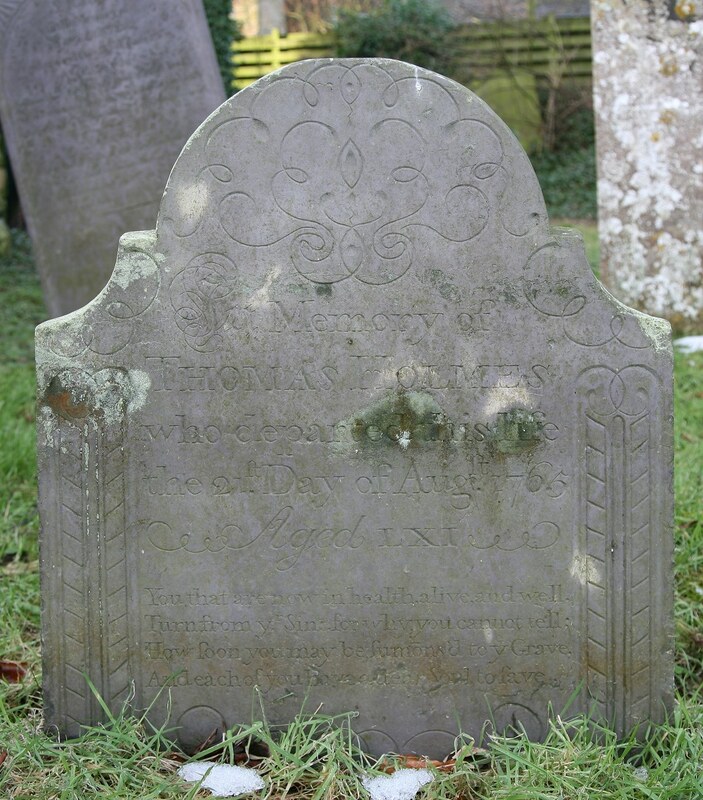 The earliest churchyard memorials to 'ordinary' parishioners tend to be small, simple headstones in local stone. They usually have naively cut letters and sometimes these letters are filled with lead. 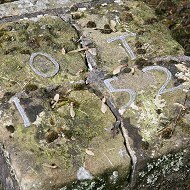 These examples are from Darley Dale (1 to 3) and Hartington (4) in Derbyshire. 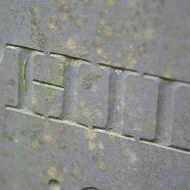 The letters are cut with a roughly square cross section and the lead poured into the cut. The surface of the lead shows blows from a tool to drive the lead into the letter, though this may be from a later date. 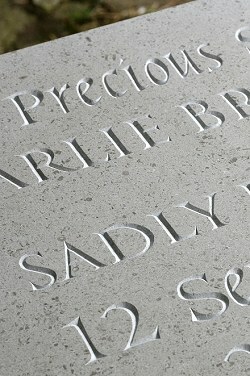 The last of these examples has had some letters refilled after the edges of the cut letters had weathered away. 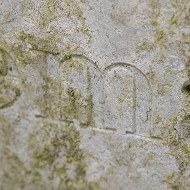 The lighting on the first example is not great, but to highlight lettering this shallow would require the light to be only a degree or two off the plane of the stone. In any other lighting the letters are very hard to read. The middle pair show the extremely shallow, flat cut of the letters. 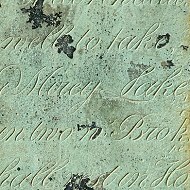 Now the edges of the letters have been subjected to nearly 200 years of weathering, even this normally crisp Swithland slate is fading away. The last example has letters which in outline are more or less Bodoni, but the main strokes merge into the serifs somewhat and are also cut in a very shallow U cross section. All in all, a dog's dinner. Raised lettering is quite uncommon, perhaps because it takes longer to remove all the material around the letters, so is less profitable for the letter cutter. 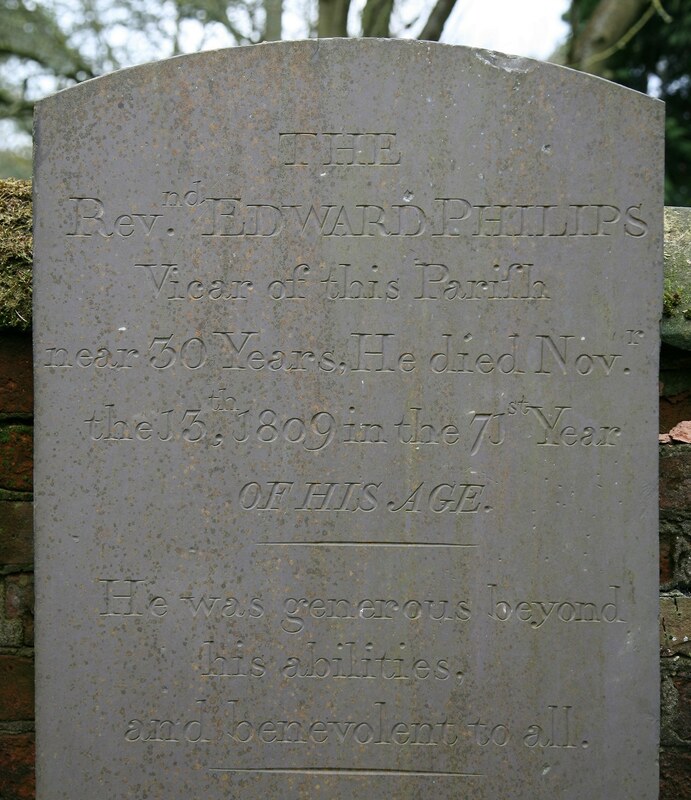 However, Swithland slate headstones, common in and around Leicestershire, occasionally have some raised lettering and the practice can be seen elsewhere from time to time. 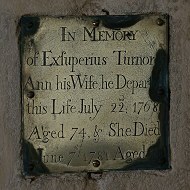 This example is from St Mary the Virgin, Bottesford. 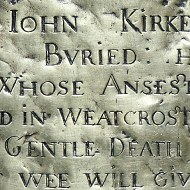 Small (and not so small) engraved brass plaques can be found inside churches as memorials to the dead. 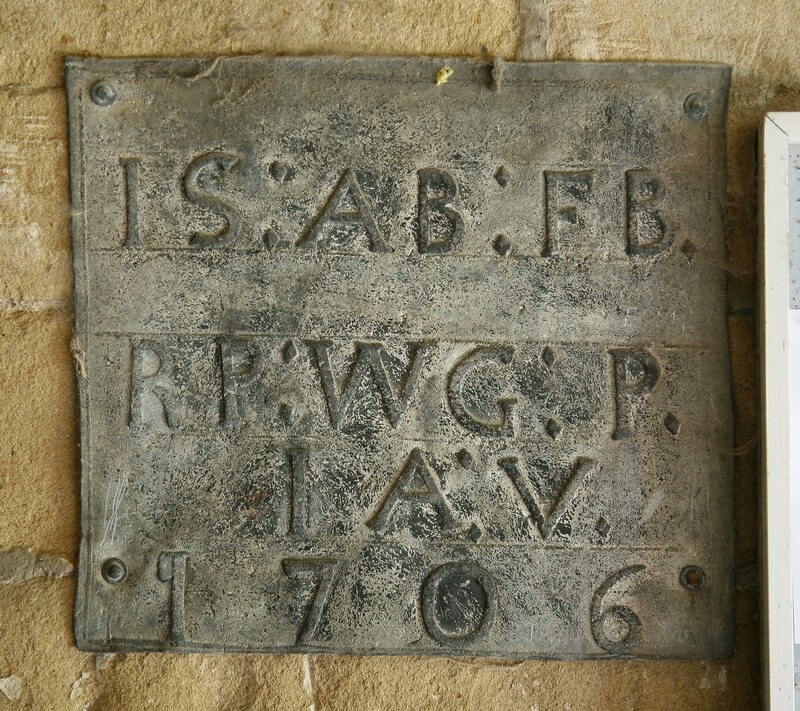 They range from panels bearing little more than the name and dates of the deceased, to more grand affairs with pictorial representations of the deceased and their families, coats of arms and other devices. 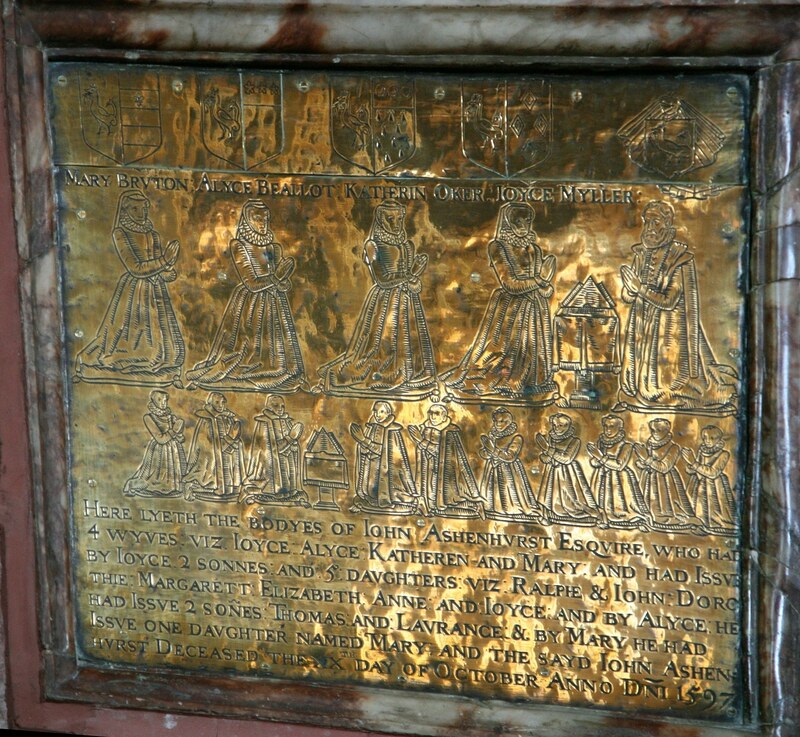 This beautiful example from Edward the Confessor, Leek, shows John Ashenhurst, his four wives and their ten children, and dates from the late 16th century. 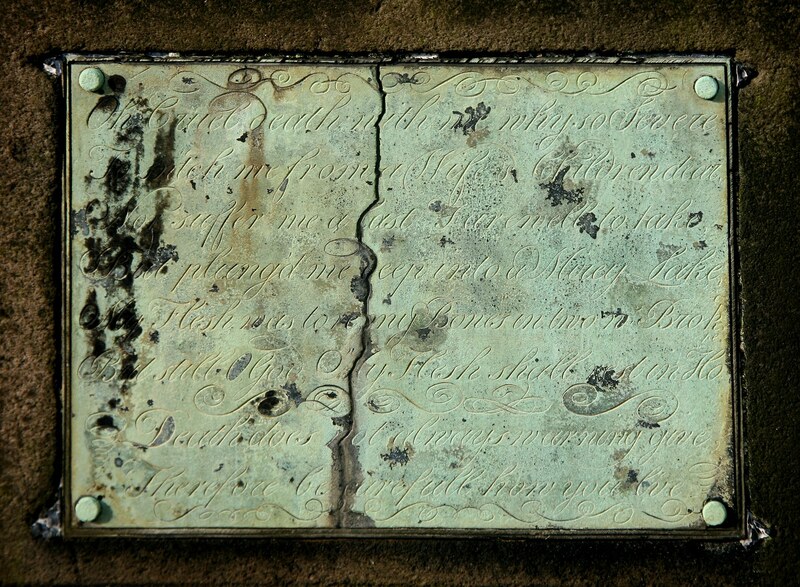 St Giles in Matlock, Derbyshire, has a few engraved copper plates attached to headstones in the churchyard. 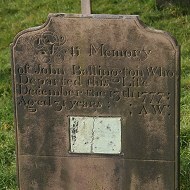 The first pair of images below show the headstone of John Ballington, who in 1777 was "plunged deep into a mirey lake". Which was careless of him. 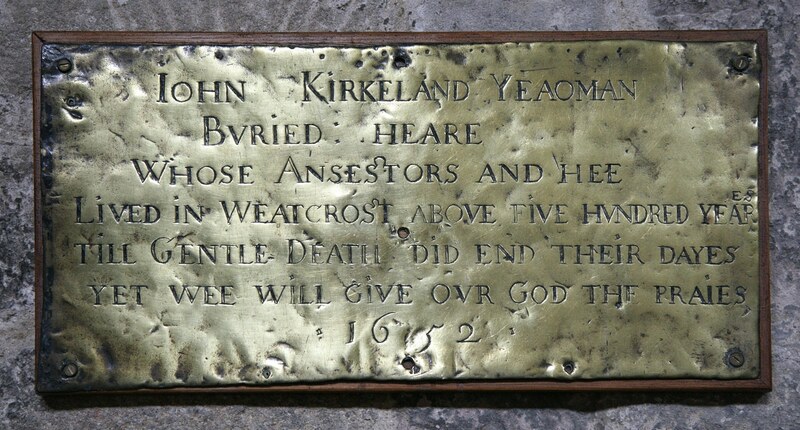 Next a small plaque in All Saints church, Mugginton, Derbyshire and a beautiful memorial to John Kirkeland in St Mary's church, Crich, Derbyshire. More letters made of lead now, but unlike lead-filled letters on headstones, described above, these are on lead panels installed inside the church or occasionally the porch. 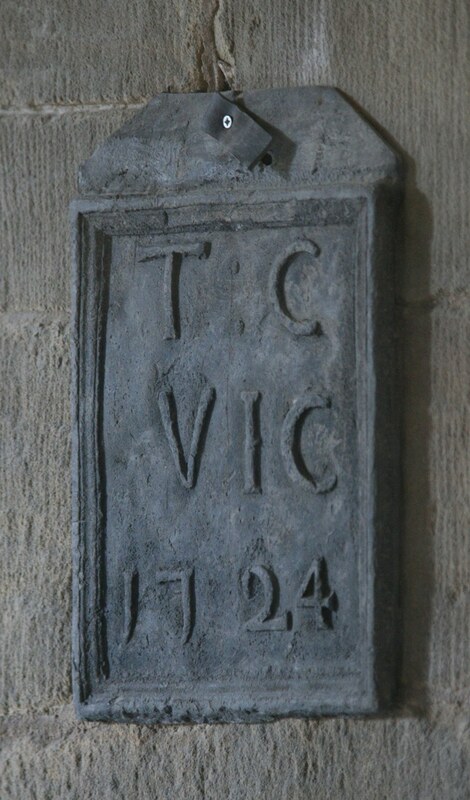 The first example here, from Baslow in Derbyshire, may be a piece cut from the roof leads or may have been made to hang in the church to record roofing work of 1785. 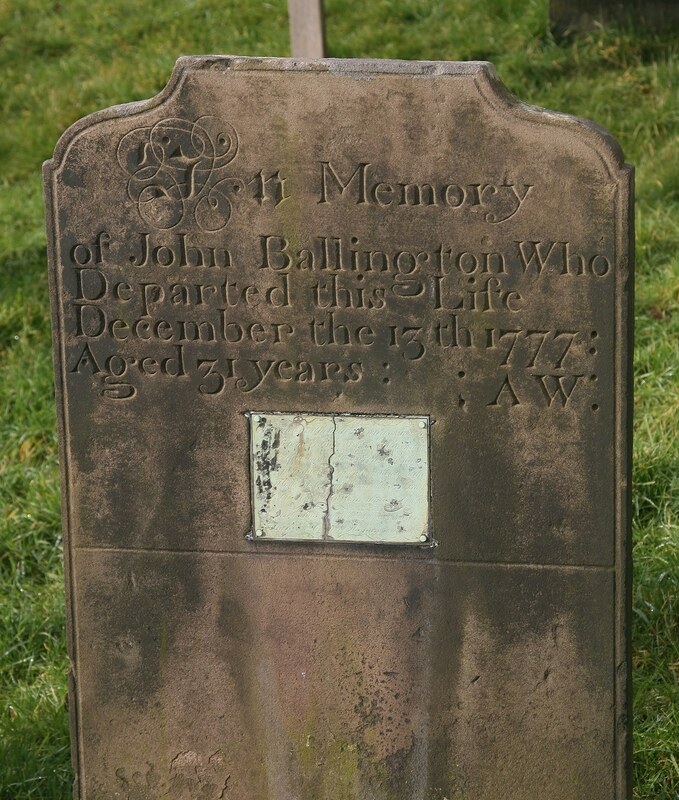 St Alkmund, Duffield, Derbyshire, has two panels, from 1963/4 and 1724. 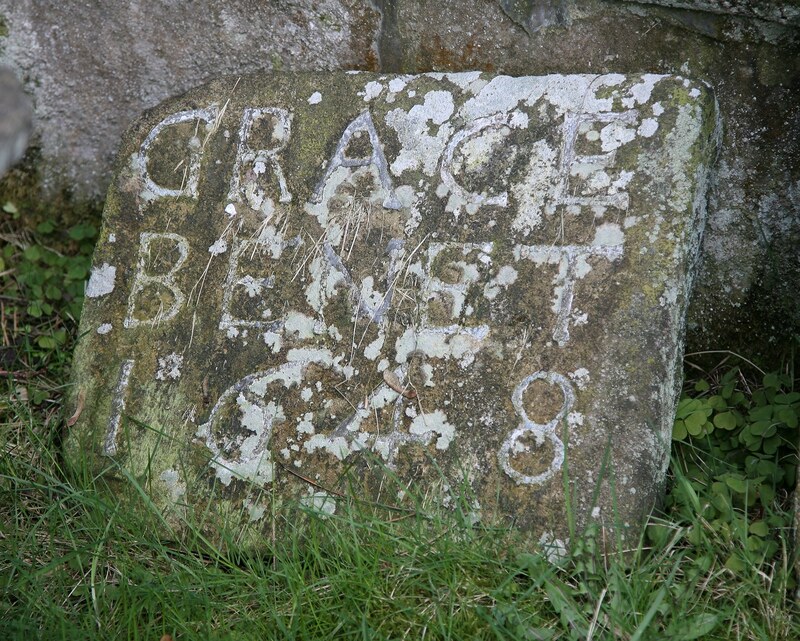 The last two examples are from All Saints, Youlgreave and St John the Baptist, Tideswell, both in Derbyshire. 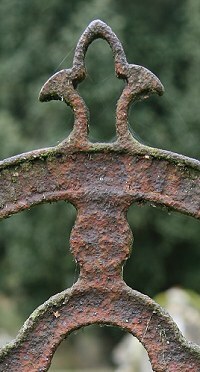 The Victorians were fond of iron. 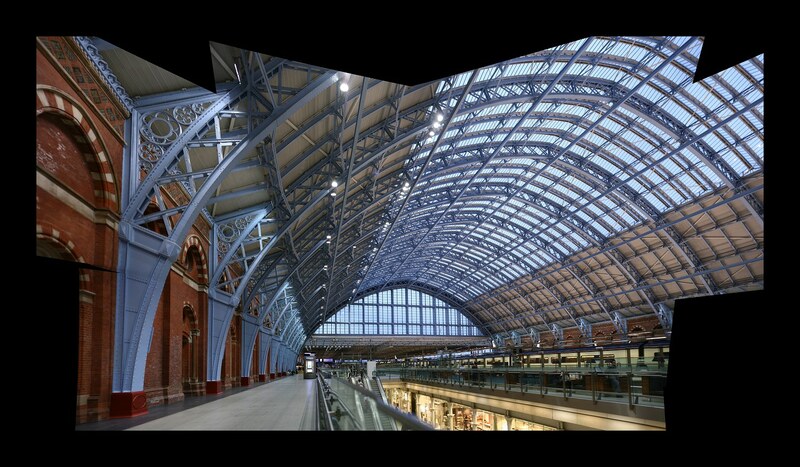 They gave us some magnificent pieces of wrought and cast iron engineering such as the roof of St Pancras Station in London, which are also breathtakingly beautiful, but sometimes cast iron is the wrong material. 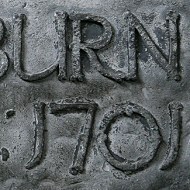 There was a brief fashion for casting iron grave markers, complete with the name of the deceased. Some of these may have been painted to protect the iron from the elements, or they may have been left raw. The end result in either case has inevitably been that they rust away. 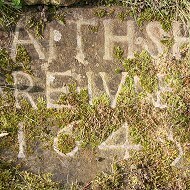 This example is from St Chad, Longford, Derbyshire. 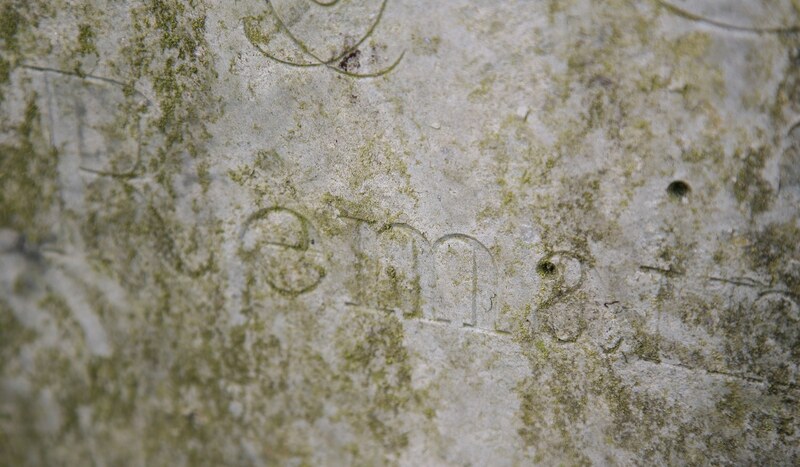 The Romans found that cutting beautifully designed letters on stone using a chisel created a visually pleasing and long-lasting result. 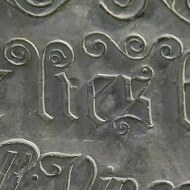 The same technique could be used for large or small letters and on a variety of materials. History shows us that people have tried other options with varying degrees of success. 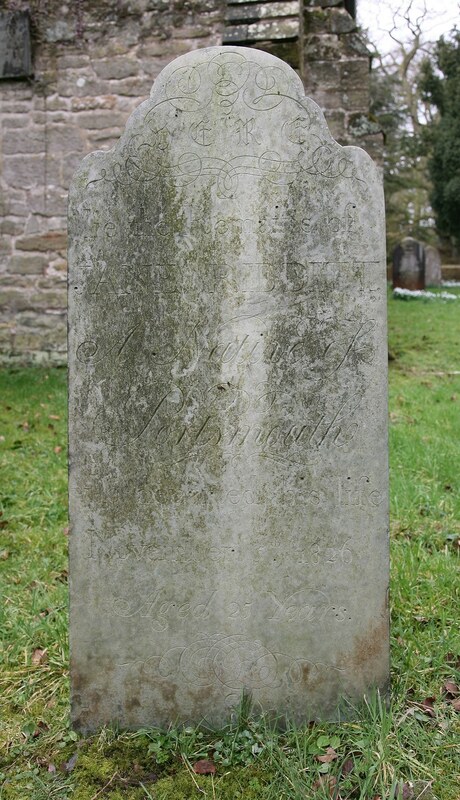 The 20th century gave us perhaps the most depressing innovation, the 'traditional' sandblasted granite headstone. Type the letters into a computer, select a piece of clip-art, click 'Print' to have a plotter cut out a rubber stencil and fire up the compressor. The people who carved the lettering on Trajan's column must be spinning in their graves. Fortunately the skills of the Romans still survive and instead of a nasty, shiny, Chinese granite slab you could have a piece of slate from Wales, Westmorland or Cornwall, sandstone from Yorkshire or limestone from Dorset. The letter carver will discuss what you want, design and lay out the inscription by hand and cut the letters with a hammer and chisel. 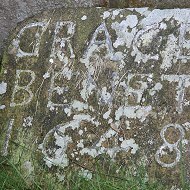 The charity Memorials By Artists was set up by Harriet Frazer in 1988 when she had difficulty finding a traditional headstone. The related Lettering Arts Trust organises courses and exhibitions of hand-carved lettering for those interested in seeing what can be done or learning how to carve letters themselves. 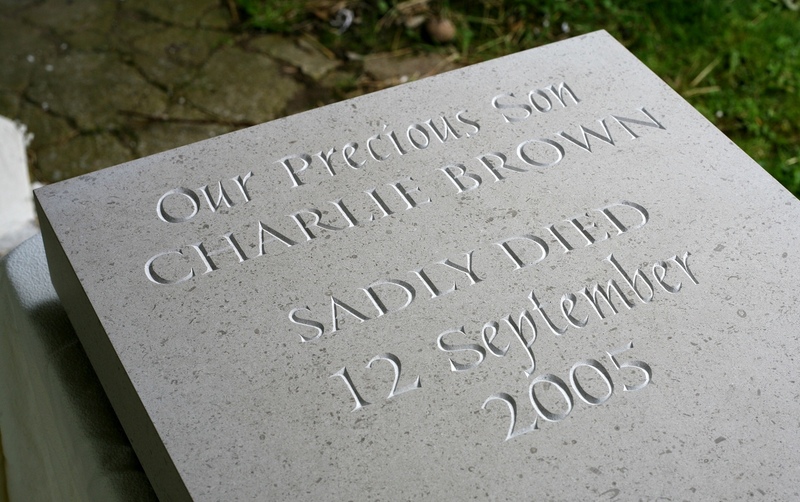 This is just one simple example in Hopton Wood limestone from Derbyshire, carved by Poor Frank Raw for a stillborn child of a friend. The Roman who carved the letters in the image at the top of this post would have recognised my tools, my easel and the way the letters were cut. I'm also sure he would be happy to find the same skills thriving, two thousand years into his future.